Blockchain, the digital exchange and recording system that allows transparent and secure interactions between multiple parties, could be the solution to supply chain issues surrounding trust, proof of transactions and digital uniqueness. Blockchain technology is a distributed ledger composed of a chain of cryptographically linked “blocks” of transactions. When an exchange occurs, all transactional data associated with that exchange is broadcasted to all contributors in the network, delivering a complete record of the exchange to each participant. Transactional transparency across participants is backed by strong encryption architecture and protocols to keep data secure yet distributed, and it may be perfect for solving age-old challenges in supply chain, such as end-to-end real-time visibility, tracking assets that are in transit and managing warehouse inventory. As blockchain evolves, so does the application of its core principles to supply chain. Because blockchain allows multi-enterprise ecosystems to work cooperatively as a single unit in a supply chain, it encourages collaboration, transparency and trust across stakeholders. It’s important to explore the long-term potential of blockchain — global supply chains thrive on innovations, and technology stacks help drive growth and reduce overall expenses. With blockchain, value can be assigned to any asset or inventory in a supply chain. When an exchange occurs, that value assigns asset ownership by location to complete transactions transparently and seamlessly. Creating digital copies of an enterprise’s assets and inventories to be distributed across the entire network improves transparency and automation, resulting in more refined business transactions. Successful implementation of a blockchain network requires absolute participation and cooperation of all participants in the network. To facilitate, external stakeholders such as suppliers, vendors, contract manufacturers, carriers and other participants must be incentivized — they need a good reason to participate in the network in order to deliver on the promised value of the blockchain. Blockchain is an emerging technology, complete with challenges surrounding the scalability and performance of current blockchain stacks. The majority of active blockchains are on private or consortium-based blockchain systems, but as the technology evolves, it is expected to expand across public networks. Supply chains that have already adopted blockchain systems have focused on logistics and asset tracking. As existing networks grow and shift toward tokenization, they have become better suited for supply chain finance and procurement-based use cases. Many implemented blockchain systems rely on time stamps and synchronized information. While this data is useful for provenance and origin tracking, it is not optimized for business transactions, as suppliers cannot make transactions on this data alone. Companies must transition from using blockchains as a place to time stamp and synchronize information to tokenizing assets. This means representing real and virtual assets, both financial and nonfinancial, as tokens in the blockchain. When assets hold value and are represented as tokens, they can be traded across the supply network in addition to being tracked and should have more accurate data. With tokenization, suppliers reap the ultimate benefits of blockchain assets. Tokenization forbids duplication, making it non-fraudulent and ensuring accurate tracking and proof of ownership in a transaction. Although tokenization is more demanding than notarization, the results are more valuable. Just as with bitcoin, assets, currencies and other tokens on a blockchain can be purchased, sold and exchanged, but cannot be duplicated. With blockchain, it is possible to represent complex business and operational networks in their entirety because they force reconciliation across the network, preventing the disappearance or doubling of assets. Using tokenization in a blockchain system ensures that inventory moves between locations and is handled with the same precision as bank transfers. If suppliers can represent it as a digital token, a blockchain can manage or track it. If suppliers can assign it a value, financial services can exist around it. Suppliers can build contracts across entities and mix assets and financial services. Setting up an exchange of monetary tokens for asset or product tokens enables companies to use flat currencies (in which they already operate and are comfortable with) for transactions. By restricting the entire transaction to an exchange inside a single ecosystem, suppliers can integrate payment with delivery to reduce risk and complexity. Smart contracts can be used to precisely control the flow of money across the network of partners, modeling complex relationships with reliability and ease. The views expressed are those of the author and do not necessarily represent the views of the global EY organization or any of its member firms. 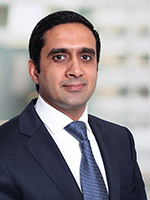 Gaurav Malhotra is a principal with Ernst & Young LLP. He is the Enterprise Applications and Blockchain Leader.